We get lots of questions this time of year so we decided to create a Christmas Lighting and Decoration Installation Service FAQ to help you be more informed. The lights are priced by the bulb. Bulbs are spaced 12” apart so we estimate by the foot. When the actual installation is complete we count the number of bulbs and that tells us what your actual cost is. Equipment (bulbs, stringers, connectors, timers, clips etc.) are one-time purchases. You pay for equipment the first year and it becomes your property. Then we charge for install and take-down. The first year cost is $6 per bulb/foot. $3 of this is for the equipment purchase (one-time charge). Install/take-down is $3 per bulb ($2 is for install, $1 for take-down). So from the second year onward, you pay $3 per bulb/foot. I need about 125′ of lights. What would my cost be? Your first year you will pay $750 (125′ x $6). Starting year two your annual cost will be $375 (125′ x $3). Do you light only houses or do you decorate other types of properties? 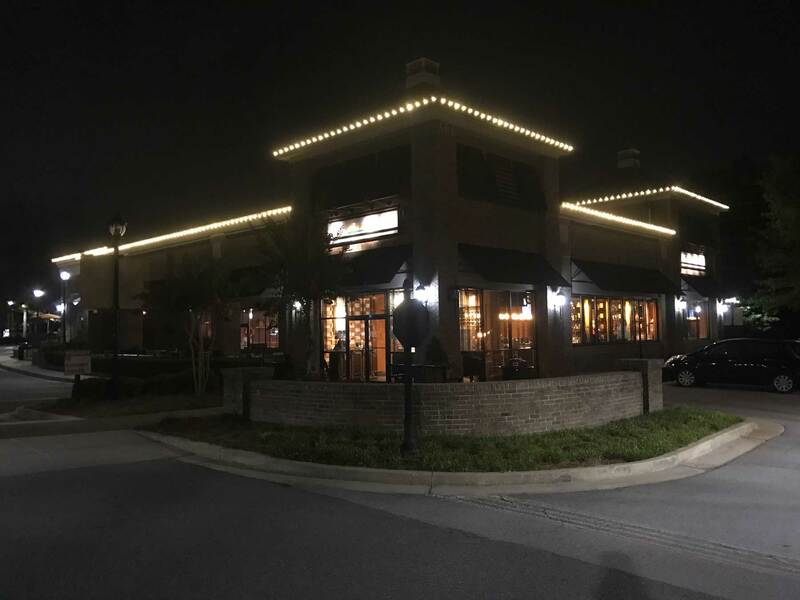 Cinco Restaurant with C-9 Christmas Holiday Lights in Suwanee, GA, Click to enlarge. We do it all from residential homes to subdivision entrances to stores, restaurants and businesses. 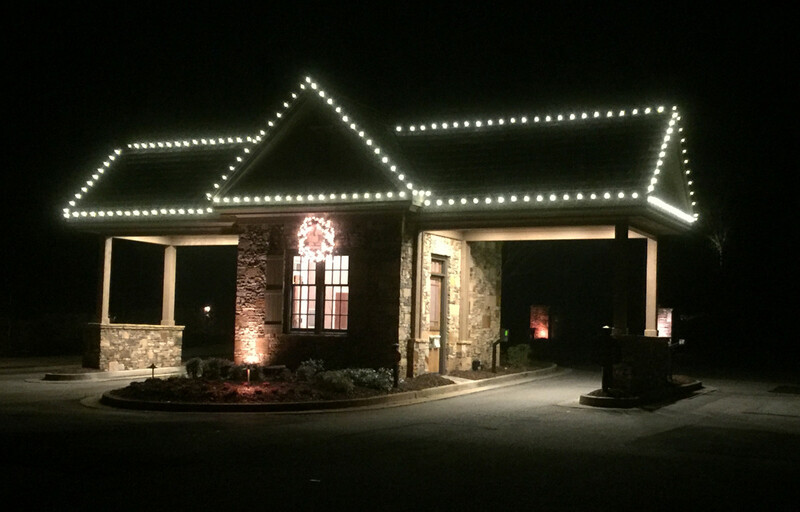 In fact, some of our holiday lighting is up year-round and you can see them at Bambinelli’s in Roswell. Buca di Beppo in Alpharetta or Cinco restaurant in Suwanee. Is there a deposit? How do you bill us? No deposits necessary. When we put them up we charge you $5 per bulb ($3 for the equipment and $2) for install. Then when we take them down we charge $1 per bulb. Next year will be $2 when they go up and $1 when they come down. When do you put them up and take them down? We set an install date and a takedown date. We should put them up some time in November. Then when you want them to go on (typically after Thanksgiving dinner) you just plug them in. We come to take them down in January (we schedule that day/time). You just unplug them when you don’t want them to come on anymore. After we take them down we leave them for you in a tote and you store them. Next November you leave the tote out for us and we do it again. How are the lights controlled? We install a timer with a photocell. When it gets dark the lights come on. If you want them to stay on until daylight set them to Auto. You can also set the timer to have the lights stay on for 4, 6 or 8 hours. Are the lights the blue LED lights? No not typically. Most of our customer prefer the look of warm white so our bulbs are 2700 kelvin warm white. What do the light bulbs and decorations look like? All of our equipment is pro-grade. Bulbs are faceted and wreaths and garland are full and thick. You can visit our Christmas Light page for more information on lights, wreaths, garland and bows. How long do the bulbs last? The bulbs are rated for 60,000 hours and typically last for many years. How much power do the bulbs use? Our LED bulbs consume less than one watt of power. In fact we can safely install over 400 of our LED bulbs on a single outlet with no blown circuits or tripped breakers. A typical installation will use less than 50kWh which will cost about $6 for the season. Do the bulbs ever break? Since the bulbs are LED they don’t get hot which allows the manufacturer to make them out of plastic instead of glass so breakage is a rarity. How do you attach the lights? Typically the horizontal parts of the house have gutters so we use gutter clips to attach the lights to the gutters. Gables don’t have gutters so we use shingle tabs to attach the lights to these areas without gutters. Each light will have either a shingle tab or gutter clip so they are uniform and stay evenly spaced. Where do the lights typically go on a house? Subdivision entrance guardhouse with C-9 lights on gutters, gables and peaks. Normally we put lights on the front of the house. Mostly on the horizontal parts, peaks and gables. Occasionally we will install scattered or wrapped mini lights on trees. Some customers like the sides of their house lit and sometimes we light the roof peaks like the guardhouse in the photo to the right. It looks like you do lots of climbing. You’re insured, right? Absolutely, we carry Business Liability, Vehicle and Worker’s Comp insurance policies. In fact, we offer 50% paid medical insurance to all of our employees!